One of the biggest struggles that beginning musicians face is learning to embrace and enjoy the process of practicing. Efficient practice is extremely important in order to progress on the piano or any instrument, but it can be difficult to stay motivated, particularly when you’re first starting out and training your brain and hands to execute basic skills. Fortunately, following some simple concepts and incorporating today’s digital technology can make practicing interesting and fun for both kids and adults, helping them enjoy the process more as they learn to play the piano. One of the most important aspects in making practicing fun is having the right outlook. Pianists should enjoy playing their instrument, not dread it. If students, especially beginners, think of playing the piano as a major task or chore, then it will be extremely difficult for them to want to practice. Of course, learning to play the piano takes lots of work. But part of the learning process is discovering how to relax, enjoy the process, and focus on the benefits and personal rewards that continuous progress and achievement will bring. Creative expression is another important aspect to enjoyable practice. If students have a boring routine where they’re told to practice only specific things, they’ll struggle to enjoy playing the piano. Students should regularly take some time to sit at the piano with no music and just try creating! Exploring the rich sound of the piano without any restrictions opens up the freedom to discover the instrument from a different perspective, providing a sense of personal satisfaction and ownership that’s not always accessible with rigid practice routines. While these routines are extremely important in developing essential skills and avoiding bad habits, setting aside time for creativity and spontaneity is a great way to help a student stay interested. As for practice material, playing one style of music exclusively for too long can start to bore and frustrate students. It’s obviously important to build a solid foundation of technique through the classic piano exercises, etudes, and repertoire; however, letting the student have some say in what they play will help them want to practice. Instead of only practicing Hanon exercises and Bach inventions, students should add music to their repertoire that they pick out themselves. Teachers can help by asking a student what kind of music they enjoy listening to, finding sheet music for their favorite songs, and working on it with them as part of their regular lesson routine. 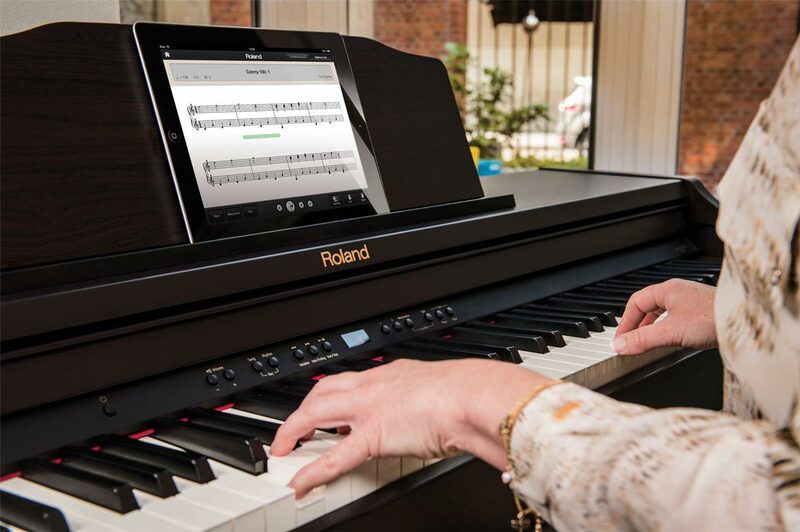 Equipped with today’s latest technologies, digital pianos like those from Roland provide numerous features that can help make practicing more fun for students. Depending on the model, these features can include the ability to play sounds other than the piano, recording music instantly for self-evaluation, and connecting to computers and mobile devices to take advantage of powerful musical apps and interactive musical games. The ability to play with sounds other than piano can be a huge asset to encourage both young and old students alike to practice. This element fits in with everyone’s need for personal expression and creativity, and experimenting with sounds like organ, strings, guitar, and synthesizers motivates players to spend more time with the instrument. Most Roland digital pianos include hundreds of additional sounds beyond the acoustic piano. Having access to non-piano sounds also allows teachers to easily relate various genres of music with their histories. For example, a teacher can explain that in the Baroque period when J.S. Bach was composing music, the common keyboard instruments available were the harpsichord and pipe organ. Thanks to digital technology, it’s easy for the student to practice their Bach pieces with the actual sound he used when he composed the piece. Another neat feature found in many digital pianos is the ability to instantly record a performance. With the touch of a button, a student can record their playing and then listen back for self-evaluation. This makes it easy to hear strengths and weaknesses, and to chronicle progress and improvement in an objective way to encourage further practice. Typically, recordings can be transferred to computers via USB, making it easy for the student to share their musical accomplishments with friends, family, and teachers via social media sites, email, and other web outlets. 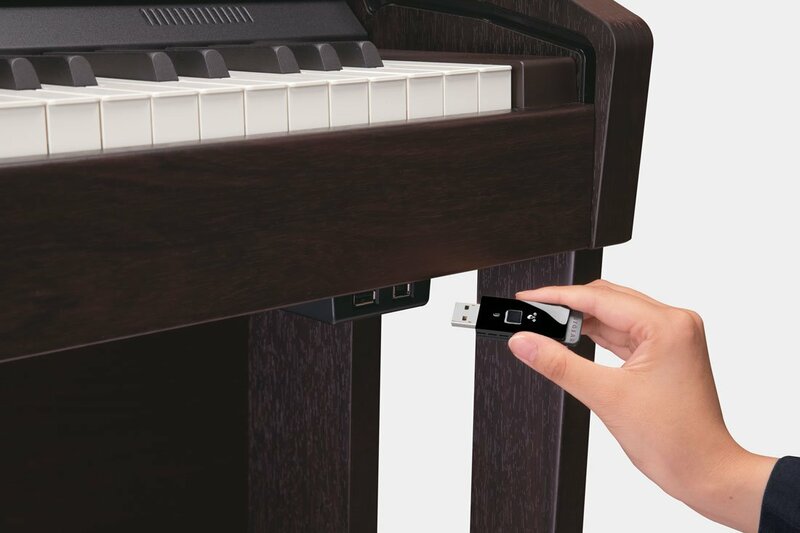 USB connectors on Roland pianos allow functions such as song recording and playback, wireless connectivity, and interfacing with computers. One of the best ways that digital pianos can help young students enjoy practicing is through electronic musical games, and some models are equipped with a large graphic display and a number of games built in. Incorporating a friendly interface with challenges and rewards, these games make note reading, ear training, rhythm development, and many other aspects of music theory both enjoyable and accessible. 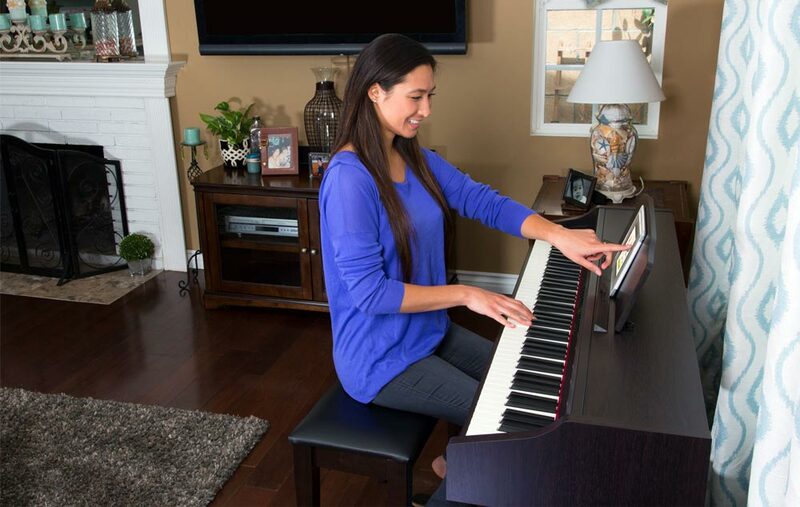 Another great bonus with many digital pianos is the ability to connect to personal computers and mobile devices like tablets and smartphones. For example, all current Roland pianos offer easy connectivity to computers via USB, and many are also compatible with Roland Wireless Connect, which provides a simple way to communicate wirelessly with Apple’s iPhone, iPad, and iPod touch. In addition, the range of free Roland apps available for iOS mobile devices is constantly growing. Fun apps like Air Performer let students play along favorite songs from their iTunes library through the piano’s speakers, while Piano Partner for iPad offers flash card games, the ability to display digital sheet music with DigiScore Lite, and more. DigiScore Lite on the Roland Piano Partner app for iPad. The point of learning to play the piano is to express yourself, create good music, and enjoy playing! With beginning students especially, the enjoyment factor can be overlooked due to the initial challenges of building basic skills. But with some diligence and patience, you will start to see improvement in a short time and gain more and more confidence as you go. Playing the piano well, or any instrument for that matter, takes a lot of work. By embracing the journey, your efforts will be rewarded with a continuing sense of joy and accomplishment, so enjoy the ride!